Your ceremony will be at a church - what to do with that Aisle? A lot of pictures will be taken from the back looking at you getting married so its nice to have the aisle decorated. Some churches have restrictions. In the below pictures we used silk petals and pipe cleaners to attach to the pews. 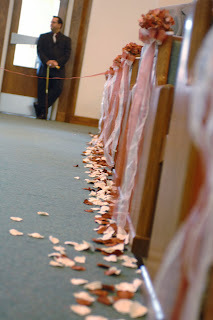 Long pew bows with rose petals. 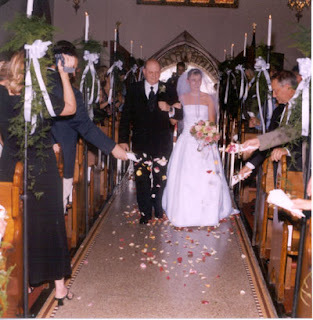 Tall candelabras and guests throw rose petals. Very simple white runner with rose petals. 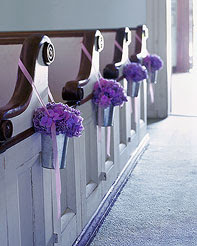 Hang Buckets of flowers on the pews. 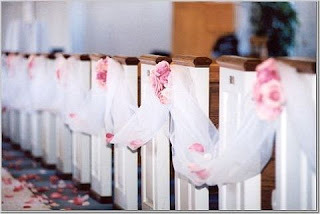 Drape the pews with organza or tulle and flowers. You've been tagged. Check out my blog for more info.